My five year old daughter, we call her the Precocious Princess here, loves to dress up. Absolutely loves it! Whenever we’re in a store, she wants to try on all the costumes. After swapping superhero in-store-costume stories with my buddies C.T. from Nerd Lunch and Terry, I was inspired. 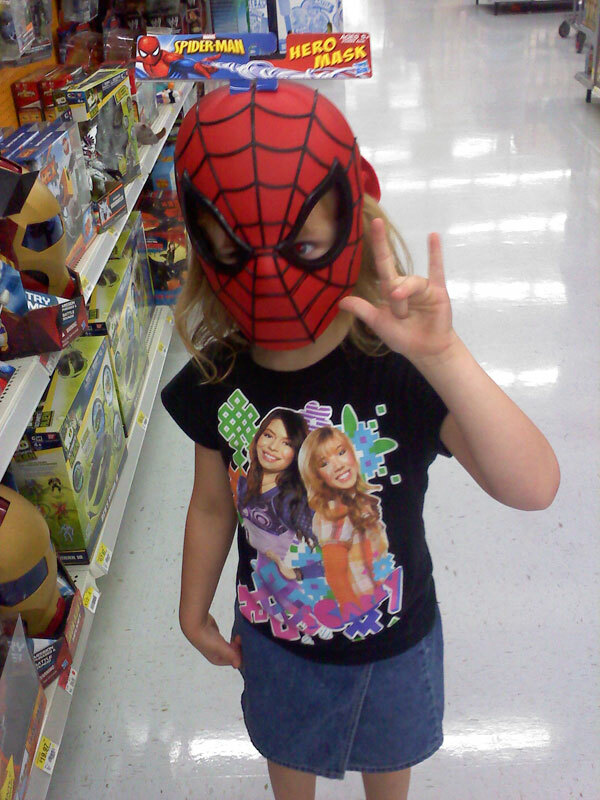 When the Princess and I next visited Wal-Mart, I had my cell phone camera ready. Enjoy! Absolutely adorable! To see her in an Iron Man mask a last year, click here. Awesome. Those little role-play masks and props are amazing. Where were they 30 years ago? That Cap shield is perfect. When I was 4 or 5, my dad took this yellow frisbee with green writing, painted a white star on it with house paint, and attached some black elastic to it. That was my Captain America shield. And I loved it. But, no offense to my dad’s efforts, but I would have much preferred the one currently in the stores. Those are great! I think the Spider-Man one is my favorite. She got the web-shooting hand signal right and everything. Ya done good. Adorable. Also (let me adjust my pocket protector before I write this) the iCarly shirt is sort of a comic book reference too. Miranda Cosgrove, who plays Carly, was the young Lana Lang in the SMALLVILLE pilot. Yup. Everything comes back to Superman for me. I got that Cap shield, it’s actually an awesome frisbee! I plan to break it out on the beach this summer. @Frank – Our lives frighteningly parallel each others. ahah! AWESOME! Captain America is my favorite. But Thor…. Oh, I can’t choose, they are all wonderful. Mike connects a Nickelodeon show with Superman. That’s shocking. I’m on the floor, staring at the ceiling, wondering how he does it. Love it. She is so cute it’s ridiculous! Any reason her eyes are red in all of those? That Thor one is awesome. 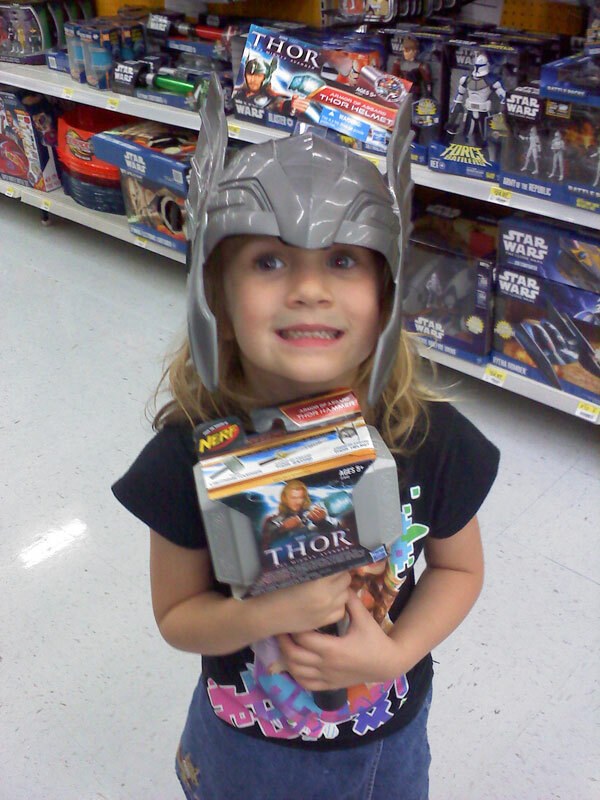 Thor-Girl, indeed! 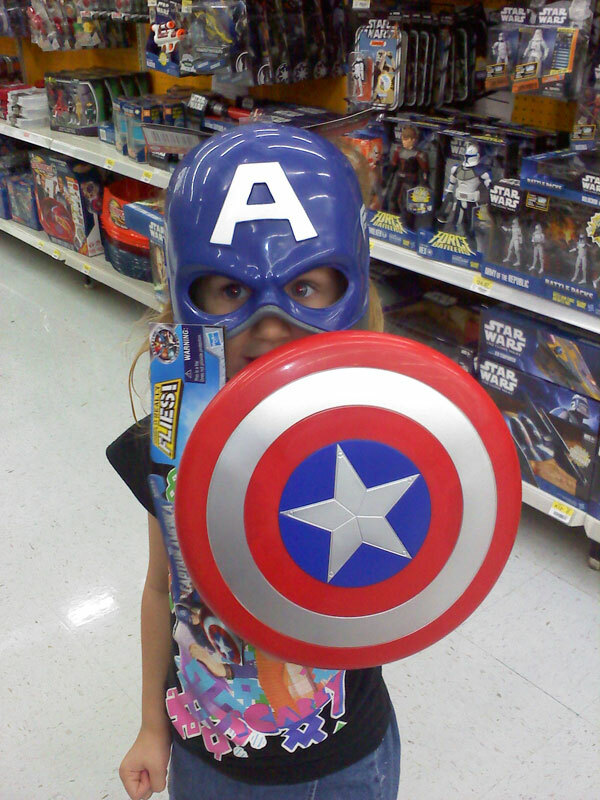 That Captain America shield is awesome!! I got get one of those for myself!! This girl is so cute! !